732 pages | 39 B/W Illus. In the nearly four decades since the First International Symposium on Victimology convened in Jerusalem in 1973, some concepts and themes have continued to hold a prominent place in the literature, while new ones have also emerged. 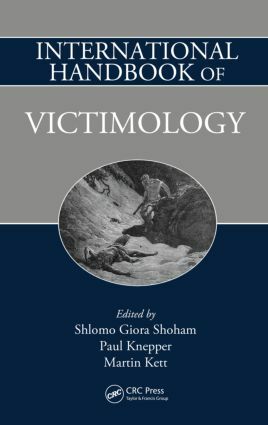 Exploring enduring topics such as conceptions of victimhood, secondary and hidden victimization, and social services for victims along with more recent issues, the International Handbook of Victimology provides an interdisciplinary study of the topic from a diverse range of professionals on the cutting edge of victimology research. Describing current research and identifying new ideas and topics of concern, the book collectively presents the “state-of-the-art” of the field today. In doing so, it helps to inform contemporary understanding of an eternal societal plague. Those wishing to continue their studies should consult the International Handbook of Criminology and the International Handbook of Penology and Criminal Justice, which complete the trilogy. Shlomo G. Shoham is Professor of Law and an interdisciplinary lecturer at Faculty of Law, Tel Aviv University, and is a world-renowned criminologist who has published more than 100 books and about 1,000 articles on crime, deviance, philosophy, religion, psychology, and the human personality. Over the years, he has developed his innovative personality theory, a highly appraised new theory of personality development. In 2003, Professor Shoham was awarded the Israel Prize for research in criminology. Previously, he was awarded the Sellin-Glueck Award, the highest prize in American criminology, and recently the prestigious Emet Prize. He is the recipient of a decoration from the prime minister of France. Professor Shoham has lectured all over the world and has been a resident at the universities of Oxford, Harvard, and the Sorbonne. Paul Knepper is Senior Lecturer, Department of Sociological Studies, University of Sheffield, and Visiting Professor, Institute of Criminology, University of Malta. His research has explored sociopolitical definitions of race, conceptual foundations of crime prevention, and historical origins of contemporary responses to crime. Martin Kett is a self-employed technical writer and translator. He received a BSc in mathematics and statistics from Bar-Ilan University, Israel.